APIs are an emerging technology for integrating applications using web technology. This approach is exploding in popularity because it builds on well-understood techniques and leverages some existing infrastructure. But it is a mistake to think we can secure APIs using the same methods and technology that we used to secure the conventional, browser-centric web. While it is true that APIs share many of the same threats that plague the web, they are fundamentally differently and have an entirely unique risk profile that you need to manage. This eBooklet provides an overview of these new risks, and offers five simple solutions to counter the common threats. 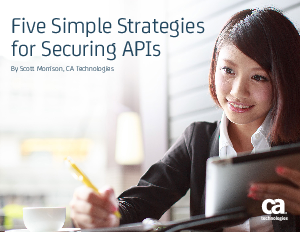 By adopting a secure API architecture from the beginning, organizations can pursue an API strategy more safely and securely — and reap the benefits of agile integration promised by this exciting new technology.